A "Family Friendly" hotel steps from the Colonial Williamsburg Visitor Center, the Woodlands features a unique conference space. Drawing on view of the beautiful woodlands just outside its doors, the conference center is a compact, easily accessible area in the visitor center campus. ****The conference reservations office is open Monday-Friday, 8:30am-5:00pm. Please mention the group name when calling-in. 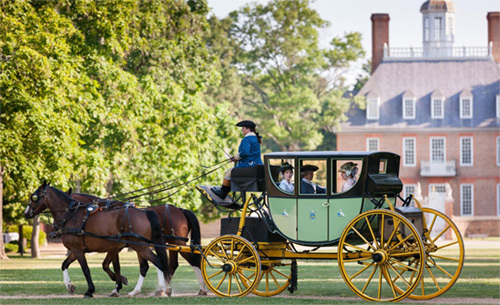 Once at the conference, travel around the Colonial Williamsburg campus is easy with the free shuttles that travel from the Visitor Center to all areas of Colonial Williamsburg. Colonial Williamsburg is located midway between Richmond and Virginia Beach, and is 150 miles south of Washington, D.C. and 200 miles north of Raleigh. Whether you are traveling by plane, train, or automobile, Williamsburg is minutes from major airports, Amtrak service, and interstates. Williamsburg is easily accessible by car throughout the region, state, and beyond along Interstate 64. Set your GPS to 101 Visitor Center Drive and look for exit 238 marked "Colonial Williamsburg." The WILLIAMSBURG TRANSPORTATION CENTER is just one mile from the Historic Area and is home to an Amtrak station, Williamsburg Area Transit Authority bus service, and taxi service. Three airports are conveniently located along Interstate 64 less than one hour from Williamsburg.